We drove towards the quilt shop, past Amish guys in buggies and women scooting along on over-sized scooters, their bonnet strings flying out behind them, past market gardens and farm stands and red roofed barns and home made ginger ale stalls. We’re not in Manhattan now, Toto. 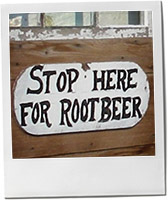 Yosi, who was driving, veered off the road down a mud track; “This is the best root beer in the world. I have to get some and I’m gonna get a gallon for my Dad too.” So I did think about featuring root beer as the Wednesday Tipple. But honestly? I think its a flavor you have to be brought up on from an early age to like. 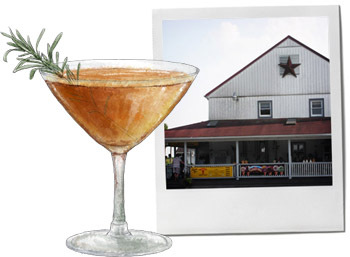 Instead, fresh from the farm stand, with an honest to goodness honesty box comes this rather special apple-tini, made with fresh Amish apple juice (though that’s not a deal breaker, you can use non Amish fresh apple juice too) and vodka flavored with rosemary and lavender from the balcony. I’ve been making flavored vodkas since I lived in Poland, where it was cheaper to buy vodka than bottled sparkling water. And when I’m feeling very enthusiastic about a flavor, or if I know I’m going to be making up a large pitcher of cocktails, I’ll get out the half gallon or even the gallon Mason jar. But there’s no need to be put off by the scale of investment when it comes to making flavored spirits – you can make a jam jars worth – 4 – 8 cocktails – and see how you like it first. 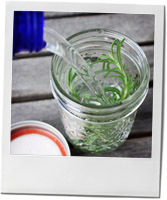 The basic idea is this; put herbs or fruit, or both in a very clean jam jar, cover with vodka or gin, screw on the lid. Shake up 3 – 5 times a day and keep in a cool place. Taste after 24 hours, and check after 36 – it will probably be ready to go. More delicate flavors can take 5 days to absorb. Now make cocktails. This entry was posted in The Wednesday Tipple and tagged amish, apple, cocktail, lavender, rosemary, sweetcorn, vegetarian, vodka. Bookmark the permalink.